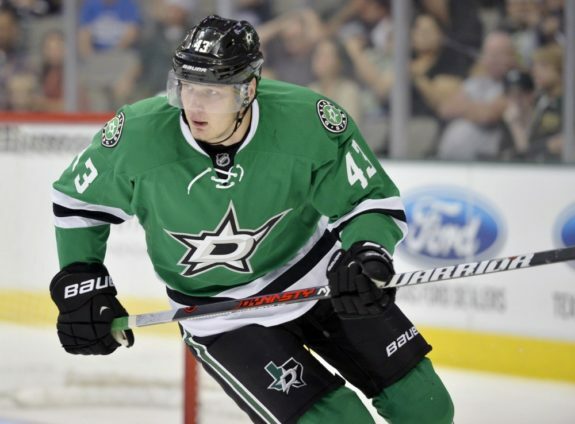 The Dallas Stars sent two forwards, Canadian left wing Jamie Benn and Russian right wing Valeri Nichushkin, to the Winter Olympics in Sochi, and it’s safe to say that both players had chips on their shoulders coming. Benn, despite being one of the NHL’s premier up-and-coming power forwards and a clear leader in Dallas, was not invited to Team Canada’s initial orientation camp in the summer but battled his way onto Hockey Canada’s radar thanks to a fantastic start to the regular season. Nichushkin, meanwhile, took almost the opposite path: the 18 year-old NHL rookie has shown flashes of brilliance this season in Dallas, but his inclusion on the Russian team came as a major surprise considering his young age compared to the rest of the team, and was even a source of controversy among the Russian team itself. However, it didn’t take very long for either player to prove to their respective teams that they belong. Benn scored the game-winning goal in Canada’s 3-1 tournament opening win over Norway, a perfectly-placed wrist shot from the left faceoff circle. He looked strong all day, registering three shots on net and playing physical in just under nine minutes of ice time. His line, alongside John Tavares and Patrice Bergeron, was one of Canada’s best in the game, and has surely earned more ice time opportunities going forward. Nichushkin, meanwhile, showed more of a flair for the dramatic in Russia’s 5-2 win over Slovenia. He bolted down the right wing, cut around the Slovenian defenceman, and slid the puck home while crashing into the goaltender for what, at the time, was a 4-2 Russian lead as the home nation crowd roared around him. Considering how well both players performed in their debuts, it will be interesting to see if the two can continue this momentum as the tournament goes on. Meanwhile, Dallas third player in the tournament, goaltender Kari Lehtonen, is also set to make his Olympics debut on Thursday against Norway. No pressure to follow suit, Kari.